Impressive. I love the style of the sketch. Does anyone know what those "dome lights" I described are really called? lol @ the main part looks like a bloodshot eye. The whole thing looks surprisingly cheap close up. I love they almost never know how to use it. Yeah, the main "iris" of the bloodshot eye in the center looks reflective/metallic to me. When light hits it, that's where they'd key in the "fireball" effect. Anyway, what I'm talking about are those six lights on the "lightbox" part. I'm trying to replicate them as actual working lights with what I can only describe as "dome lights". EDIT: Zack, that extreme close-up on the central drum almost certainly indicates that the prop was welded together in some way. Thanks for the info...now I know it's not all one piece. I wonder, are they lights? That certainly would be cool and would have made the prop a little better if it had blinking lights or even if it was dark enough where you could tell they were lights. 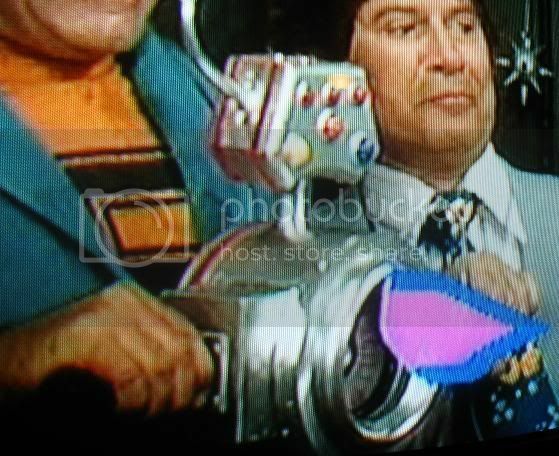 I'm curious because on some of the DVD packaging, they're solid silver like the rest of the prop. I wonder if those look like welds or just glue lol They look like they could be the led lights from Radio Shack. I have a couple on my slime blower. I forget what the actual name is, if thats what they are, or could be! That would be awesome to have lights and the spinning part. BTW the spinning parts on top looks really familiar, I can't quite place what it is. Not just the grips but it definitely looks to be bike handle bars, ya think? 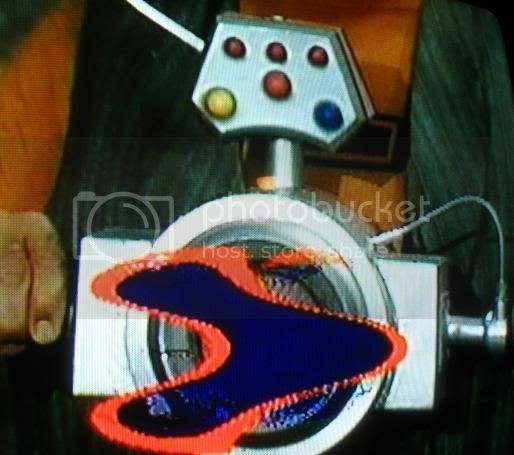 I didn't get a clear shot in the few episodes I saw but the back of the dematerializer, looks to be completely flat/blank. Don't forget an old carpet bag to store it in Don't mind the reflection on the screen/bad picture. Or well, is that just a funny shape? 1: No, they didn't light up in the original show. It's an embellishment for my version. As for the DVD packaging, it's clear that the images have been photoshopped in some way to produce the desired effect. 2: So many people have said those are the handlebars from a bicycle...could be, could be. On my version, I'm going to change the "ghost finder" from a spinning mirror to a more radar-dish-like shape. I took another look at those pictures of yours, Zack, and I've come to a few conclusions. First, it looks like only the side pieces were made separately and attached later. At first, I thought they made the outer "lip" separate from the rest of the drum, but from what you provided, it looks like it's all one piece. THEREFORE: the back of the Dematerializer isn't a part of the drum--it's just a lid. What they did was, they made the drum, slipped in the shutter, and put the "bloodshot eye" in behind that. After that, they put the rear lid in and sealed it up. Naturally, mine has to be hinged, so I'm going to have to figure out how to hold the iris in more permanently. and put the "bloodshot eye" in behind that. After that, they put the rear lid in and sealed it up. 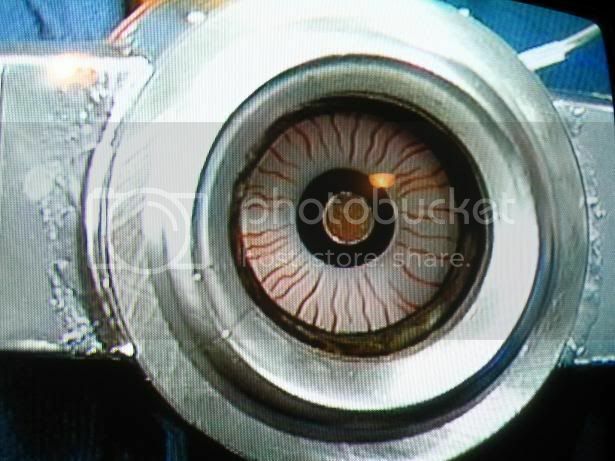 Naturally, mine has to be hinged, so I'm going to have to figure out how to hold the iris in more permanently. ... but was that a REAL gigantic ghostly eye anyway? By "they" I meant the propmakers. I'm willing to bet that it was just a device that resembled a giant eye. I can't find your new interpretation of the Dematerializer's basic concept anywhere... (in terms of sci-fi). Could you repost that here? I just remember you wrote that on the FGB1986 board. Nix, the link is... dead!